Today’s Defence-related coverage includes a meeting of nations from the Joint Expeditionary Force, and the Armed Forces’ new flexible working arrangements. The Army’s new flexible working arrangements were discussed at length by the panel on Good Morning Britain today. Hosts Piers Morgan and Susanna Reid discussed the new measures at length with guests including former service personnel. The new measures, include expanded accommodation options and new co-habitation rules, which are designed to modernise the Armed Forces and ensure the military remains a competitive employer that meets the changing needs and expectations of service personnel and their families. "It’s hugely important that the armed forces keep pace with modern society, creating a more attractive option to live, work and bring up a family. "By making our policies fairer and more flexible, we will help retain our diverse and talented workforce and give them greater freedom as they carry out their service. The Daily Telegraph is among the papers to report that defence ministers from contributing nations to the Joint Expeditionary Force (JEF) will meet in London at the Ministry of Defence to discuss the Baltic Protector deployment. A total of 3,000 military personnel from all JEF nations will be involved in the Baltic Protector deployment, which draws in around 20 naval vessels, including a number of Royal Navy ships. This is the first ever JEF maritime deployment of this scale, and demonstrates its ability to provide reassurance in the region. The meeting was also covered by MailOnline, the Daily Record and the Scotsman. "It is a huge privilege to command the Baltic Protector deployment, and I am greatly looking forward to working with our close friends and partners from the other eight Joint Expeditionary Force partner nations. 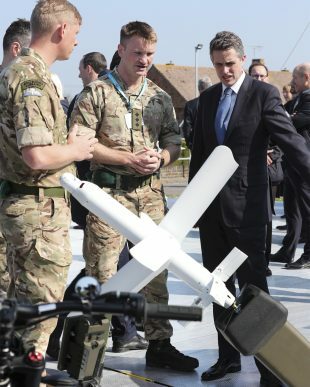 Defence Secretary Gavin Williamson visits QinetiQ's Portsdown Technology Park. During a visit, the Defence Secretary saw first-hand the world-leading work being done in the field by British industry. Crown copyright.